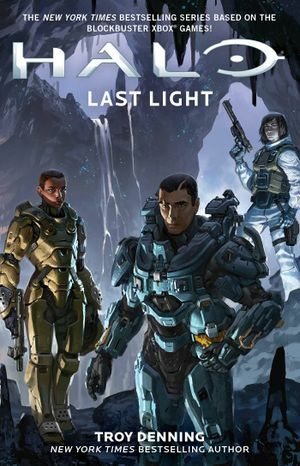 Halo: Last Light is a full-length print novel from Simon & Schuster written by New York Times bestselling author Troy Denning. It was released on September 15, 2015. “ It is 2553, and the three-decade long Covenant War that defined a generation has suddenly drawn to a close. Yet, in the remotest parts of human space, tensions remain that threaten to overflow into another full-scale conflict. Beneath the surface of the planet Gao lies a vast cavern system renowned for its therapeutic effects and rumored miraculous cures. But now Gao natives are turning up brutally murdered down there—violent acts that happen to coincide with the recent arrival of a UNSC research battalion protected by Spartan Blue Team, led by the renowned Spartan-II Fred-104. In July 2553, the United Nations Space Command has deployed the 717th Xeno-Materials Exploitation Battalion, escorted by Blue Team, to the human Outer Colony of Gao in the Cordoba system to locate a Forerunner ancilla located deep within the planet's Montero Cave System. The ancilla, Intrepid Eye, was awakened from stasis when Line Installation 444-447 on Shaps III sent a distress signal to Covert Support Base 4276 on Gao after nearby Forerunner ruins were glassed on the planet. When Intrepid Eye attempted to contact the rest of the ecumene, only Commander Murtag Nelson of the UNSC detected the ancilla's signal, bringing them to the planet in search for her. The UNSC's presence is unwelcome on Gao; the planet's residents embrace Gao's near-total independence from the Unified Earth Government and believe the UNSC's arrival at the colony is an attempt to increase the military's control over Gao. Intrepid Eye's curious Huragok companion, Roams Alone, has become fascinated with the humans, and chooses to heal their illnesses, while erasing their memories of him or Intrepid Eye. However, this results in more Gao natives flocking to the planet's caves, where the Forerunner support base is located, in hopes of having their own maladies cured by the cave's apparent therapeutic effects. Learning that the UNSC intends to capture her and of the UNSC's poor reception on the planet, Intrepid Eye murders several Gao residents in the caves, hoping that Gao blames the UNSC for the murders that started when they arrived. However, it instead results in a joint Gao Ministry of Protection and UNSC investigation in the caves in search for the murderer, while the UNSC covertly hopes to find the ancilla within the caves. As Intrepid Eye is responsible for the murders, the victims' bodies appear to have been brutally killed by an individual with incredible strength or by someone using a powered exoskeleton. Special Inspector Veta Lopis of the GMoP, raised by her anti-UEG parents to despise the UNSC, is skeptical about the Spartan-IIs and IIIs of Blue Team—composed of Spartan-IIs Fred-104, Kelly-087, and Linda-058, and Spartan-IIIs Tom-B292, Lucy-B091, Ash-G099, Mark-G313, and Olivia-G291—and believes that one of the augmented humans may be responsible for the murders. While Lopis and members of her team are investigating a crime scene alongside the Spartans and several UNSC personnel, UNSC Marine Private Hayes arrives at their location and informs his UNSC superiors of a newly discovered murder victim. Major Ira Halal of the UNSC Judge Advocate General's Corps covertly has Hayes bring him to the body, without the knowledge of the GMoP investigators, so he can document the crime scene without their interference. On the way to the new crime scene, they spot Roams Alone. The Huragok attempts to greet the humans, but he catches them by surprise and Hayes attempts to assault Roams Alone. In response, Intrepid Eye kills the two humans, but not before Halal is able to wound Roams Alone. Intrepid Eye discovers a fragment of the smart AI Wendell attached to Halal's TACPAD; the AI informs her that her homeworld of Shaps III is now in ruins, leading to Intrepid Eye removing Wendell's memories of their conversation. After returning to the UNSC's temporary headquarters at the Montero Vitality Center, Lopis eavesdrops in on a conversation between Fred and Commander Nelson and learns that the UNSC's investigation on the planet involves Sentinels and an ancilla. Unfamiliar with the latter term, Lopis relays her discoveries to Minister of Protection Arlo Casille. Casille, currently aboard his patrol corvette—Esmeralda—is meeting with representatives from the radical Ex-Covenant sect Keepers of the One Freedom and the insurrectionist Venezian Militia. Casille intends to overthrow President Tejo Aponte, believing him to be a coward for allowing the UNSC to land on the planet; Dokab Castor of the Keepers and Reza Linberk of the Venezian Militia agree to help Casille in his coup. Learning of the ancilla on Gao from Lopis, Castor insists that he must retrieve the "holy Oracle". Casille and Linberk agree, but both individually plan to steal the ancilla for their respective factions. After losing contact with Halal and Hayes, Fred, Ash, Mark, Olivia, Lopis, and her partner Cirilo return to the Montero Cave System to search for them. They eventually arrive at their location and discover their corpses. Fred recovers Wendell from Halal's damaged TACPAD and places him in his helmet's data chip. While investigating the scene, Cirilo finds a trail of blood from Roams Alone and the team follows it. Meanwhile, having infiltrated Wendell's systems from their previous encounter, Intrepid Eye is using the AI to spy on her pursuing humans. Realizing that she is running out of options to escape, Intrepid Eye contacts Wendell and orders him to have the Spartans stand down. The AI refuses and the ancilla sends her last four remaining Aggressor Sentinels to attack the humans in response. After a brief engagement, the humans are eventually able to destroy the Sentinels, but Cirilo is killed and Olivia's legs are badly wounded. Fred leaves to investigate the area, while the rest remain in a small cavern. Lopis, realizing that the Spartan-IIIs are barely even teenagers, is furious that the UNSC recruited children for use in the Human-Covenant War. The three Spartans explain to Lopis that they—as Spartan-IIIs of Gamma Company—require regular doses of a drug they refer to as "Smoothers" to counter another drug added to them during their augmentations that allows them to fight more aggressively when in danger or under heavy stress. Without the Smoothers, they will gradually become more paranoid and prone to impulsive behavior. This discovery causes Lopis to list the Spartan-IIIs of Gamma Company, particularly Mark, as her prime suspects in the murder case. Meanwhile, Roams Alone's curiosity causes him to disobey Intrepid Eye's command to remain hidden when the Huragok spots the resting humans near the pile of rubble. As the Huragok greets them, the Spartans are glad to learn that Roams Alone—as a Huragok for the Forerunner Lifeworkers—is capable of treating the Spartans' injuries. They contact Fred, who has just discovered Covert Support Base 4276, and inform him of their discovery. Wary of investigating a mysterious, camouflaged Forerunner installation alone, Fred agrees to return with the rest of the team to Gao's surface with Roams Alone. In Montero Jungle, just outside of the village of Wendosa where some elements of the 717th Xeno-Materials Exploitation Battalion have set up camp to prevent hostile forces from entering the nearby cavern entrances, Castor and five hundred of the Keepers' Jiralhanae, Kig-Yar, and human forces have landed and are preparing to retrieve the ancilla. Intending to search for the ancilla in the Montero Cave System, Castor's forces begin to enter an undocumented entrance to the caverns while he converses with Linberk and Petora Zoyas, Minister Casille's representative. The Committee to Preserve Gao Independence had intentionally triggered UNSC alarms throughout the encampment at Wendosa to distract the forces at the village to give the Keepers a better chance of entering the caves unnoticed. After Zoyas continues to insist that they need an escape plan after they find the ancilla, Castor realizes that Casille's allies and the Venezian Militia intend to steal the ancilla for themselves, although he was not worried as he had loyal human forces infiltrate the militia and Ministry of Protection. Castor sends his second-in-command Orsun to lead the forces in the caves and has Zoyas accompany them to serve as a guide, while Castor and Linberk remain back to direct forces into the caverns. In Wendosa, Kelly, Linda, Tom, and Lucy are delivering one of the bagged murder victims to a Pelican dropship, when they are spotted by the Keepers. Believing the bagged object to be the ancilla the Spartans are trying to extract, Castor forgoes his original invasion plan and orders his forces to attack the village and retrieve the ancilla. The Keepers shoot down the Pelican and fire mortars on the town, while the UNSC responds with heavy sniper firing, killing Linberk. At the Montero Vitality Center, Commander Nelson realizes that Gao's Well of Echoes is an entrance to the Forerunner Support Base and attempts to recall the Spartans to investigate; however, he learns that this is impossible when he is informed of the attack on Wendosa. Major Tereem Wingate launches a Pelican and two UH-144 Falcons to support the battalion's forces at the village, but the Keepers attack the Vitality Center and shoot down the Pelican and one of the Falcons while the surviving aircraft flees the attacks. In the caves, the Spartan-IIIs are running out on Smoothers while they make their way to the exit. While Mark is patrolling ahead of them, Lopis continues to attempt to figure out if Mark is responsible for the murders by questioning Olivia, much to her annoyance. Along their way, the team encounters dead Keeper forces killed by Mark and realize that Wendosa is under attack. Wendell contacts Lopis and agrees that Mark may be a viable candidate for the murderer, when Lopis is suddenly attacked by a Jiralhanae. Mark arrives and together the two of them kill the hostile. Meanwhile, in the Gao capital of Rinale, in the People's Palace, the Gao Cabinet of Ministers have convened to discuss recent events. During the meeting, Casille attempts to turn several fellow ministers against Aponte and insists for the president to declare full independence for Gao and attack the UNSC, but Aponte and Minister of War Gasper Baez refuse. To appease the more anti-UEG ministers, Aponte agrees to neither aid nor attack the UNSC in the attack on Wendosa and reluctantly gives Casille permission to use his fleet of twenty patrol corvettes against the UNSC battle group near Gao if they attempt to enter the planet's orbit, knowing that Casille's lightly armed corvettes are no match for the UNSC task force of warships. Back in the caves, the Spartans, Lopis, and Roams Alone encounter Intrepid Eye, who has switched hosts from her maintenance skin to an inspection drone to appear less threatening. Out of options, the ancilla has decided to surrender herself to the UNSC in hopes that they bring her back to their base, where she can escape and operate their interstellar communications device to contact the rest of the ecumene for assistance. While Fred attempts to capture her, Ash and Mark fight Keeper forces up ahead while Lopis and Olivia rest. The two are approached by Zoyas who holds Olivia at gunpoint. Zoyas informs Lopis that she is a friend of Casille and wishes to capture the ancilla; while Olivia begins to think that Lopis is affiliated with the minister and his radical allies, Lopis is unaware of Casille's schemes and does not know who Zoyas is. Fred attaches a scramble grenade to Intrepid Eye, which prevents her from operating properly as it scrambles her systems every half second while also causing a blinding light throughout the cavern. With Lopis and Zoyas blinded from the light, Olivia kills the latter and disarms Lopis. While Olivia no longer trusts Lopis, Fred more or less believes Lopis and insists that they do not have time to discuss the issue, and the humans depart the cavern with the ancilla and Roams Alone. Finally exiting the caverns at Wendosa, Fred and the Spartans learn that most of the battalion at the village is holed up in Hotel Wendosa while the rest of the Blue Team is attempting to disrupt Keeper operations. As they attempt to rendezvous with the rest of Blue Team, Roams Alone removes the scrambler from Intrepid Eye and the two escape. Meanwhile, having learned that Fred had found Intrepid Eye and returned to Wendosa, Nelson orders to last Falcon to travel to the village and extract the Spartan and ancilla and bring them to the Vitality Center. At Wendosa, Intrepid Eye overrides UNSC, Gao, and Keeper communications and prevents anyone from communicating with each other. While Fred pursues the ancilla and Huragok while avoiding sniper fire from Castor, Olivia and Ash reinforce him and they eventually capture Intrepid Eye with another scrambler again. Fred spots Mark holding a combat knife to a Marine sergeant's throat; without his Smoothers, Mark has become more paranoid and aggressive. Fred eventually coaxes Mark into releasing the Marine, who then informs Fred that Nelson is evacuating him to the Vitality Center, much to his reluctance. While en route to the landing zone, the Spartans and Lopis are attacked by a charging force of Jiralhanae. Kelly, Linda, Tom, and Lucy arrive, and together the Spartans and Marines are able to kill most of the attackers. Fred soon arrives at the LZ with Intrepid Eye and departs on the Falcon, which is filled with evacuating Ministry of Protection personnel of Lopis' team. As it takes off, the aircraft is shot down by Keeper forces and crashes nearby. Blue Team minus Fred regroups with Lopis and Roams Alone, and they resolve to travel to the Falcon crash site to recover the ancilla and search for survivors. In orbit around Gao, Casille is aboard Esmeralda monitoring the UNSC task force. In attempt to aid their forces on Gao's surface, the UNSC sends Pelican and Owl insertion craft with troops aboard. Casille orders his fleet of patrol corvettes to destroy the UNSC dropships, knowing that the UNSC is aware that if they respond by attacking the corvettes, they will instigate another insurrection on Gao. With the UNSC deterred from reinforcing the battalion, Casille declares his intentions to replace Aponte as president with the Cabinet's support. Back at Wendosa, Blue Team and Lopis travel to the Falcon's crash site on the Briones Ridge, but are intercepted by Castor and several of his Jiralhanae intending to retrieve the ancilla. As the Spartans engage the Jiralhanae, Castor searches the Falcon's remains and finds Fred who is unable to move as his armor's mechanical joints had locked up during the crash. Lopis, furious at the deaths of her friends aboard the craft as well as Fred's apparent death, attacks Castor and wounds the Dokab. Castor drops Fred, causing a violent rockslide, which Lopis survives by riding on top of Fred's armor. As Lopis recovers at the bottom of the hill, the battalion's Alpha Company arrives at their location and helps fight off the surviving Jiralhanae. Lopis later awakens at the Vitality Center, where she is greeted by Nelson who informs her that the Keepers have been fought off and are now retreating. Blue Team, including Fred, survived the battle and are now recovering elsewhere at the Vitality Center, while the ancilla was recovered. With access to Smoothers again, the Gamma Spartan-IIIs are properly functioning. Nelson tells her that her entire team was killed either during the assault on the center or during the Falcon crash. Furious upon learning that Minister Casille is using the unfortunate events for his own means to gain power and become President of Gao, Lopis agrees to strike a deal with Nelson; in exchange for never speaking of the ancilla, Huragok, or Forerunner installation on Gao, as well as pinning the murders on a Keeper Jiralhanae, Lopis requests permission to take scrapings from the Spartan-IIIs' SPI armor and Intrepid Eye's physical form to determine who the true murderer is for personal satisfaction. Nelson reluctantly agrees and brings her to the location of the armor and ancilla at the Portable Spartan Support Module near the Vitality Center. While she collects her scrapings, Intrepid Eye recovers and intends to escape. However, Wendell contacts her and informs her that humanity—the species chosen by the Forerunners to reclaim the Mantle of Responsibility—merely wishes to use her to advance human knowledge and technology, before allowing her to locate the ecumene. The ancilla considers the option, but learns that Casille has just taken office as president and issued an order for Gao to attack the UNSC. Disappointed that the species selected to be the Reclaimers appear to be so inherently violent, she decides that humanity is not worthy of the Mantle and destroys Wendell. Intrepid Eye takes control of the PSSM and begins to kill the humans inside through a variety of methods. As Nelson and Lopis attempt to escape, Intrepid Eye slams an exterior hatch down on Nelson, killing the commander, and traps Lopis inside an airlock which she then begins to fill with poisonous gas. However, Fred, Ash, and Olivia arrive and free Lopis. The ancilla attacks the humans and kills one of the module guards, but Intrepid Eye's inspection drone is damaged when the other guard shoots the drone in response. Blue Team, Lopis, and Roams Alone regroup, while the rest of the UNSC is evacuating off the planet before Gao forces attack. The Spartans decide to recover Wendell's data chip—which now covertly hosts Intrepid Eye—and then retrieve a HAVOK tactical nuclear weapon to destroy the Covert Support Base to prevent it from being under Casille's control. As Blue Team, Lopis, and Roams Alone flee from pursuing Gao Wyverns in M12 Warthogs, Lopis concludes that the killer is in fact Intrepid Eye rather than Mark. While Lopis protects Roams Alone and Intrepid Eye's inspection drone with Ash and Olivia for support, the rest of Blue Team recovers the data chip and the nuke. The Spartans manage to destroy two of the Wyverns, while the third one retreats; however, Roams Alone leaves the humans and departs to study Gao's native wildlife. Unable to retrieve the Huragok in the heat of the battle, the humans reluctantly let him go. Lopis, Ash, and Olivia regroup with Fred who has recovered Wendell's data chip and inserts it into his helmet. Just as Lopis explains that she believes that Intrepid Eye had taken over Wendell, the ancilla takes control of Fred's armor and attempts to kill Lopis. However, Lopis activates a small charge she had placed into the armor's power supply unit earlier in case the murderer was a Spartan, leaving the armor powerless. As the Wyverns deploy Gao battle-jumpers to engage them, the Spartans and Lopis hold off their attackers until Blue Team regroups, now with the HAVOK. As they escape in Warthogs, Fred sheds his armor and Kelly extracts the data chip carrying the ancilla. Fleeing the pursing Wyverns in the Warthogs, the Spartans head towards the Well of Echoes, planning to drop the HAVOK inside and destroy the installation. Meanwhile, Intrepid Eye becomes resigned to her fate of helping the UEG and humanity as a whole, realizing that the inheritors of the Mantle were more resourceful than she initially realized. However, she decides to eventually escape captivity to contact the rest of the ecumene. Aboard the Warthogs, Lopis receives a call from Casille. The newly elected president offers her the position of Minister of Protection if she helps his Wyverns locate the Spartans to "rescue" her from her UNSC "captors"; Casille realizes that Lopis is hardly a hostage, a fact that she is aware of. Before ending the call, Lopis misleads Casille into believing that the Spartans were traveling to the nearby Singing Grottos, causing most of the Wyverns to change course. Soon, the humans arrive at the Well of Echoes, just as an Owl insertion craft—UNSC Silent Claw—arrives at their position to extract them. The humans board the craft, where they are greeted by Rear Admiral Serin Osman. Osman offers Lopis the opportunity to place Intrepid Eye's data chip on the nuke before it detonates to make the ancilla face justice for her crimes, but Lopis realizes that the chip was not the one containing the ancilla and denies her offer. Mark drops the nuke into the Well of Echoes and it detonates shortly after the Owl departs, destroying the Covert Support Base. The Owl heads to rendezvous with the rest of the UNSC task force near Gao. Ten minutes later, aboard Basilisk forward command-and-control craft Independence, President Casille and Minister Baez overlook the destruction caused by the HAVOK. Casille informs the "Aponte loyalist" that he intends to withhold the information about the Forerunners' presence on Gao, as well as Lopis' betrayal. Instead, he decides to claim to the public that Lopis died with the rest of her team at the Vitality Center and his forces sent the UNSC into retreat after he learned that the Spartans were murdering tourists in the Montero Cave System. Requiring a way to keep the hundreds of Gao soldiers aware of the truth quiet, Casille offers to keep Baez—an experienced commander—on his Cabinet if he can accomplish that. Baez agrees, beginning a partnership between the two former political rivals. Aboard Silent Claw, Osman, Lopis, and the Spartans discuss the Gao events as the Owl detours to avoid patrol corvettes. Osman congratulates Lopis for passing one of her tests; she realized that the data card that Osman claimed to contain Intrepid Eye was fake in four seconds, nor was she afraid of the armed HAVOK. Additionally, Osman claims that the Office of Naval Intelligence requires someone with her investigation skills. Before Lopis can decline, Osman reveals that she has to list the Gamma Spartan-IIIs as KIA, since if the public ever became aware of their Smoother problem, it could destroy the newly created Spartan branch. Instead, Osman offers to create a top-secret investigations and black operations Ferret team composed of the three Spartans and led by Lopis. Realizing that she can not return to Gao and seeing the opportunity in applying her skills on a much larger scale, Lopis accepts the opportunity alongside Ash, Mark, and Olivia. Meanwhile, in the Montero Jungle, the mortally wounded Castor is being aided by Orsun as the two slowly walk to the Keepers' rendezvous point to escape the planet. Realizing that he is going to die, Castor orders his second-in-command to leave for the rendezvous point without him or else he will be left behind, but Orsun refuses. As they continue, the two Jiralhanae are greeted by Roams Alone. The Huragok heals Castor's wounds and prepares to leave. Orsun grabs Roams Alone so that the Keepers can have an effective medic, but Castor orders him to leave the Huragok alone, as he believes Roams Alone's work is a gift from the "Oracle". As the two Jiralhanae continue to the rendezvous point with new-found strength and speed, Castor plans to eventually enact revenge on Casille. The novel's cover is illustrated by artist Kory Hubbell, who also designed the cover of Halo: Hunters in the Dark. Purchasing the physical book grants a REQ Pack for use in Halo 5: Guardians.